Had some fun last night with a rather large trout. The fighting and landing spot could have been a tad easier; it behaved well initially and shot straight up into the pool, then behaved very badly and shot back down and under the barbed wire fence. Had to drop the rod and walk (run!) round to the stile, picked up the rod and lo and behold still on, and sitting nicely in the ford. A little more shenanigans under the lower fence but forced back up and into the net! The net is 20 inches which it fills rather nicely so I reckon about three and a half pounds. The spot pattern looks suspiciously stockie like but it has a few red spots and decent tail (although well rubbed on the underside). I think if it is a stockie it’s been holed up there for quite a while. What do you think? A very odd mayfly season (if we are coming to the end of it..?) with sporadic hatches and not as many trout in the usual places. 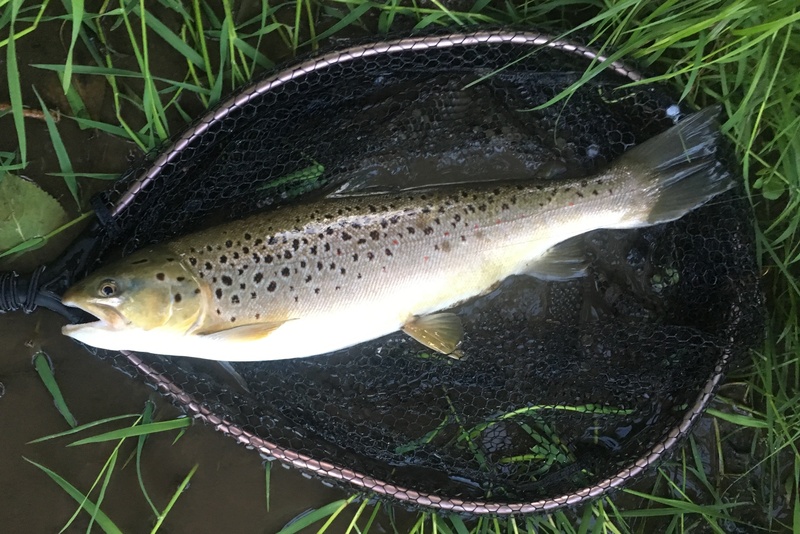 The bigger ones I’ve had have pretty much all been in hidey hole places and in shallower water – I had a pound and a half fish from right under the metal bridge just before catching this big one. Very few flies on the wing yesterday evening until about 8.30pm and then they all appeared in a rush and had quite a few fish up and at them. Several members complaining about lack of fly and fish – talking to Charles Rangely – W yesterday, he says they’ve had comparatively poor sport at Frampton – but I think it’s been one of those years when the fly has come off at odd times (the evening falls have been great on some evenings, so they must have hatched at some point the previous day..) and having to look into all the little backwaters / bushes.